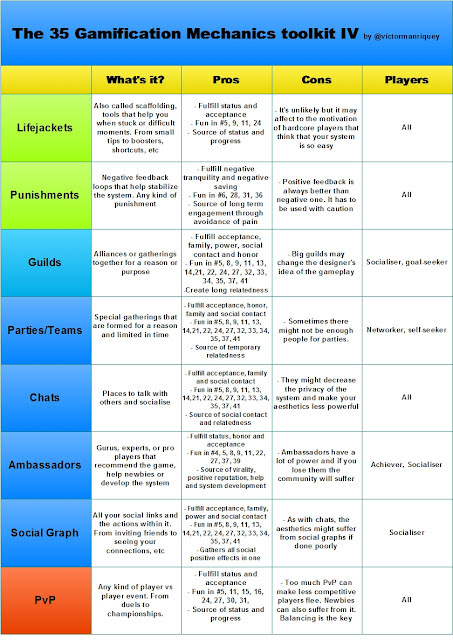 Important Update 15/10/13 -> The NEW 35 Gamification Mechanics Toolkit (v2.0) is here! If you still want to see how the first version of the mechanics was done, keep on reading! What are the most powerful gamification mechanics? What are their main psychological benefits? 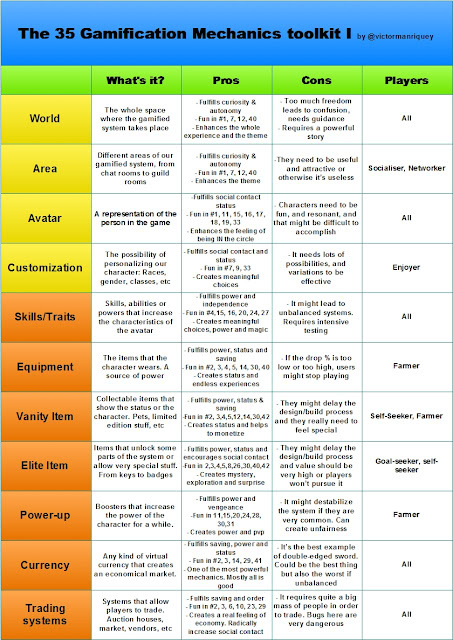 And how can we mix the gamification players and their favorite mechanics? 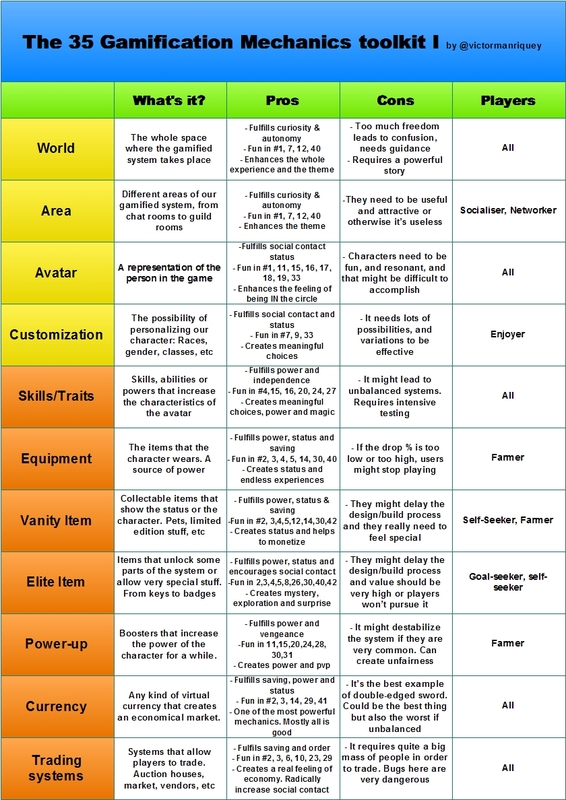 These are the 3 main questions that have come to all of us when designing a gamified system. Want to know the answers? Follow the steps, and let the magic begin! 3º Have a look at the 35 mechanics list and think which ones are better for your system! 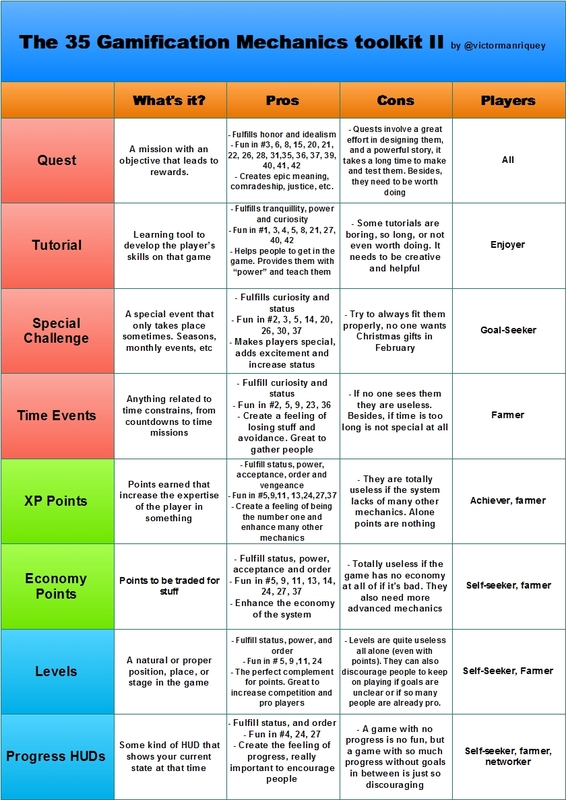 UPDATE: 35 Inspiring Game Mechanics Examples for Gamification-> check it out! ** Every # symbol means a number, so for example, when it says: "Fun in #5, 15, 21, 30" it means that the fun of that mechanic is in some of the fun things of Jon Radoff's list numered from 1 to 42. So when we mix it all, we have a description of each mechanic, the ups & downs of each one of the 35 and the players that fit better in every situation. 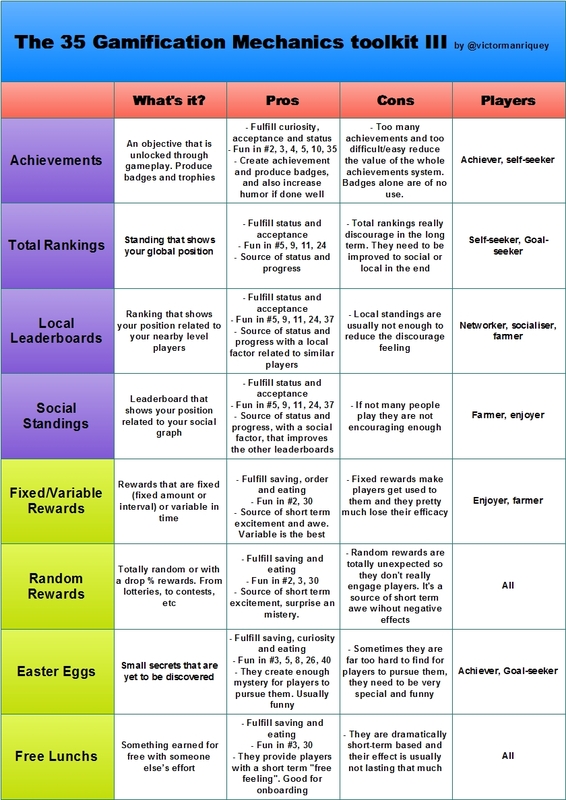 - These are the main gamification mechanics, but they can evolve and be personalized in many many ways. 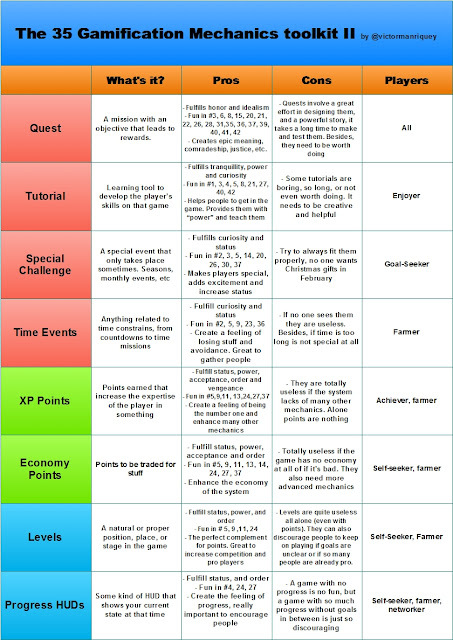 Take this as a starting point, something like a beginners toolkit to develop your creativity and expand gamification's boundaries!!! Thanks to all the people that has contributed to make this model better, and to all of you that have shared it and made this post an amazing record breaker for Epic Win Blog in all ways. Last but not least, i want to thank all the great game and gamification authors, in especial Yu-kai Chou (@yukaichou), Andrzej Marczewski (@daverage), and Kevin Werbach (@kwerb) , for their direct or indirect collaboration in this new toolkit, they are always a great source of inspiration!